The reggae singer fresh from the island of Boracay made the 4 coaches of "The Voice of the Philippines" season 2 turn their chairs around on a blind audition. Kokoi Baldo who is a native from Negros Occidental sings his own rendition of Matisyahu's "One Day." The 35-year-old dad reggae singer is working in the small but famous island of the Philippines, "Boracay." Baldo had learned Bob Marley songs when since he was a child 'cause his mother used to sing it while doing the laundry. Coach Sarah G was the first one who've push the button to turn around at the barefoot, dreadlocked performer, followed by Coach Apl.de.ap and Coach Lea then Coach Bamboo. 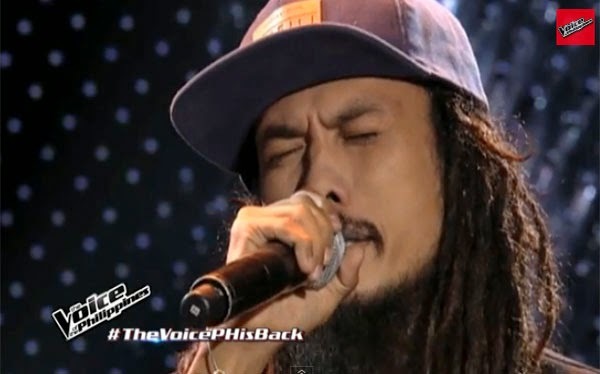 Watch the Bob Marley of the Philippines "Kokoi Baldo" performance on The Voice PH 2. Kokoi Baldo chose to be with team Sarah G, then said, "Yung pinili ko para maging coach, kasi siguro, mas gusto ko pang matuto kung hanggang saan ang kaya ko as a musician." For more The Voice of the Philippines 2 related information, Please bookmark this page for updates and you may also share this post to your friends. Comments or suggestions about "WATCH: Reggae singer turns 4 chairs on The Voice PH 2" is important to us, you may share it by using the comment box below.